Animated house price charts, the gif that keeps on giffing. Another remix! It’s a remix of a chart we made here, though it uses a different index. In the earlier post, we used the FHFA house price index, but this one used the Case-Shiller Index, which was released today. Let me just post two gifs and then below will be the R code I used to create them. First, I modified our code for the FHFA index to get the Case Shiller index via FRED. For the second gif we can create a function that will plot a line plot for an arbitrary number of cities. 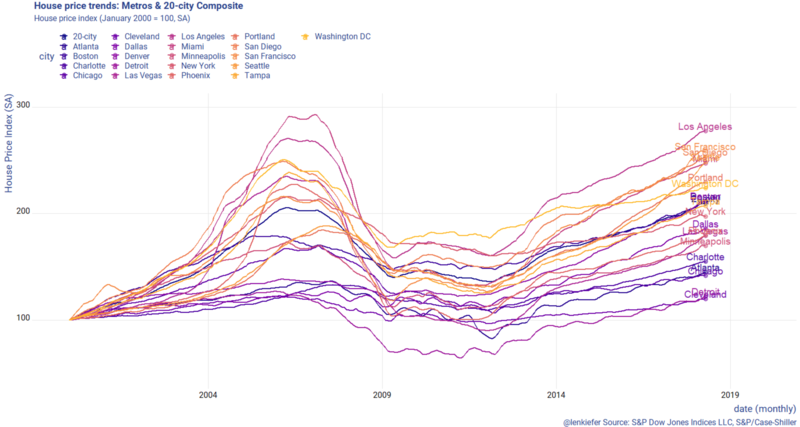 Case-Shiller has 20 of them and a 20-city composite index, as well as other flavors. In my example posted above, I selected three California metros. But by varying the call for cities, you could collect whatever number you wanted. Though it gets messy if you try to plot them all using the function defined below.